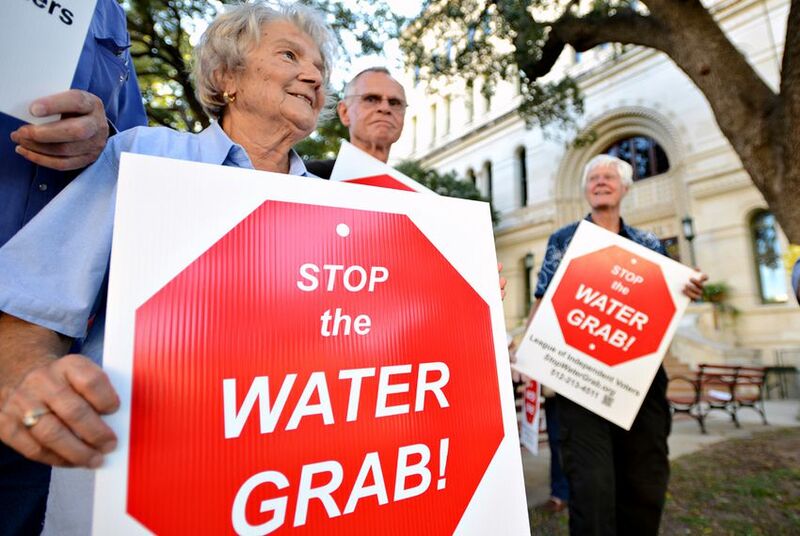 At a San Antonio City Council hearing on a $3.4 billion contract that would pipe 16 billion gallons of water a year into the city, residents called for more time before a vote to buy some of the most expensive water ever sold in Texas. The San Antonio Water System board unanimously approved the project at the end of September, and Wednesday was the City Council's first public hearing on the project. Its members could vote on the pipeline as early as this month. Called the Vista Ridge pipeline, the venture is a private project spearheaded by two companies — Austin-based BlueWater and the Spanish company Abengoa. The pipeline would serve 162,000 new families, and San Antonio residents would see a water rate hike of about 16 percent. The pipeline would begin pumping water into the city by 2020. “I think that’s a complete bogus number,” Montemayor said. “All this pipe is going to do is facilitate growth in the city of San Antonio. What we want is a good place to live — we don’t want a sprawling Los Angeles." But San Antonio Water System President Robert Puente said the 16 percent is an average, and some residents could see lower rate hikes than that. Responding to criticism that the process has been too fast and not transparent, Puente said the board first asked for proposals three years ago. There have been more than 70 public meetings, he said. Until just a few months ago, Puente cautioned against the contract — but reversed his decision recently after changes were made to the proposal. Proponents of the pipeline say it would expand the city’s water supply beyond the Edwards Aquifer and help guarantee water for a growing city. The Vista Ridge pipeline was met with droves of support Wednesday night from leaders of the real estate, medical and business communities, who said the pipeline would increase the city's water supply and keep jobs in San Antonio. "Real public dialogue has been largely absent from this process," Duesterhoeft said. "Making presentations to the chamber of commerce is not enough. Opening the doors to the public and asking them to sit quietly in the back is not enough." Disclosure: The San Antonio Water System is a corporate sponsor of The Texas Tribune. A complete list of Tribune donors and sponsors can be viewed here. Correction: An earlier version of this story misidentified San Antonio Water System Board President Robert Puente. It also misspelled the name of the Spanish company Abengoa. Finally, the story gave an incorrect year in which the Vista Ridge pipeline would begin pumping water into San Antonio; the correct year is 2020.